In the Irish Times today “Housing crisis: Modular homes delayed until 2017” Dublin City Council (DCC) have confirmed that 131 ‘rapid’ houses promised for completion this year will not be delivered until 2017. The delay comes despite recent claims from Minister Simon Coveney that Drimnagh and Darndale units were to be completed before year-end. DCC’s executive housing manager Tony Flynn said the original time scales had not been realistic and said the council had made it clear to the Government there was “no point” in seeking to complete projects in a timescale which suppliers could not meet. Last week Minister Coveney announced 1,500 rapid-build units would be delivered by 2018, 200 of which would be in place by the end of this year. So far in Dublin only 22 have been provided. Despite widespread criticism the Department of Housing, Planning, Community and Local Government (DHPCLG) is pressing ahead with the roll-out of more ‘rapid’ building projects. Cost-Benefit of ‘Rapid’ vs permanent homes? 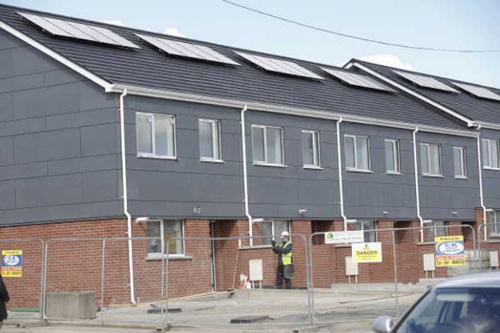 The cost of the proposed ‘Rapid’ units is likely to be similar to the tendered cost of €243k excluding Vat previous completed units in Poppintree, Ballymun completed in May 2016 (pictured above). 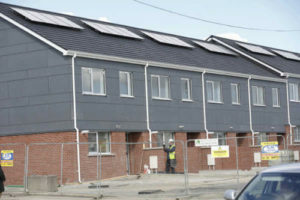 The completed Ballymun project has been widely criticised as being more expensive than existing permanent homes for sale in the same location. A similar development of ‘stackable’ apartments planned for the city cost £150 (€170,000) per unit in London, excluding site and other costs. It is surprising that the Government are spending this amount on building while cheaper apartments are available for sale. 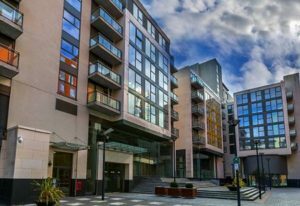 In December 2015 Iris Reit purchased 442 permanent completed apartments in a mixed use scheme in Tallaght Cross, Dublin from NAMA (see here). The cost was just €100,0000 per unit (net of the commercial element) and apartments in this impressive development are now available to rent (see here). The original contract figure [For Poppintree units], agreed by DCC and the Department of the Environment, of €5,340,775.00 for the 22 houses equates to a cost of €242,762.50 per house. This figures excludes any site purchase cost, planning application costs, development levies, or developer’s profits. Comparable, index construction costs are €100,000 – €140,000 for this type of social housing… Although we are not aware of site costs in Ballymun, 29 ‘rapid’ units are planned for a site in Drimnagh which was purchased by DCC for €3.5m. This suggests a per unit site cost of €120,000, and eventual total cost including site of over €360,000 per temporary unit. This next phase of tenders appear to be PPP “turnkey” design-and-build, traditionally a very expensive way to procure housing. Under the Irish Building Control system successful tenderers will self-certify, control quality, inspections on site and certification of compliance with building regulations- all without independent inspections. The quality control and safety checks in the Ballymun housing is controlled by the contractor, because that is the way that DCC has set it up. The houses will be inspected and certified privately by people engaged by the builder. The rapid build school that had fire safety problems was built by the same company that is providing the rapid houses in Ballymun. Our current system of ‘reinforced self-certification’ is just that – self-certification by contractors of their own work with no independent oversight. Recent experience of defective ‘rapid’ build schools suggests that in the event of a defect later on the state, remarkably, will bear the costs of repairs. The Irish case is in marked contrast to the UK example, pupils still in attendance at all schools subject to ongoing audit for over a year, the report has yet to be published. Schools defects and building failures have been in the media both here and in the UK. In Edinburgh two Public Private Partnership (PPP) schools suffered partial wall collapses and 17 schools build by the same contractor were immediately evacuated pending audit (see here). Financing for social housing appears similar to that used in the ‘rapid’ schools programme- the Public Private Partnership (PPP) model. In the UK, decades of expensive public sector PPP projects has left debts of over x5 initial capital costs. Commentators such as Rory Hearne have been critical of this type of procurement in Ireland when it has applied to social projects such as housing, schools and hospitals (see Combat Poverty Agency “Origins, Development and Outcomes of Public Private Partnerships in Ireland: The Case of PPPs in Social Housing Regeneration:” by Dr Rory Hearne 2007). The suitability of timber frame construction such as used in ‘rapid’ builds for multi-unit housing has been called into question. Recent experiences in Millfield Manor where 6 timber framed terraced houses burnt down in 20 minutes have raised alarm bells in Ireland (see here). Last month it was revealed in the media that a damning fire report commissioned in 2012 by Fingal County Council into fire problems in Holywell in Swords was never published. Although remedial work was carried out by the Local Authority to make 55 homes safe, Local Authority tenants were not made aware of the dangerous state the units were in. They were not evacuated and repairs were made only when units became void. It would appear that the Local Authority ‘put their head in the sand’ on safety problems and continue to leave tenants and owners live in dangerous homes rather than act or make them aware of the serious safety issues (see here). It is unclear what action residents will now take against the Local Authority. Dwellings examined in the report were of timber frame construction. Where exacting construction materials and details are used, site inspection and quality control are of the utmost importance to occupant safety. In design-and-build contracts the developer/contractor is in control the entire process and directly employs professionals to ‘self-certify’ quality and compliance. The Certificate of Compliance and Completion from the Assigned Certifier is thought by some to be a guarantee. DCC Tender documents require the builder to sign-off on all statutory regulations. This is of concern as it suggests no independent oversight or inspections of the quality and safety of the units provided. Experience in Millfield Manor, Longboat Quay along with many other developer-led residential projects suggest that allowing developers to control the procurement process and employ certifiers directly, without any independent state inspections or adequate enforcement, will lead to poor quality and in some cases hazardous construction (see here). ‘Self Regulation’ has failed citizens repeatedly and the current BCAR SI9 system of ‘reinforced self-certification’ does little to address these issues. Given the history of Priory Hall and more recent examples, it beggars belief that the Government is set on a housing initiative that favours developers who build quicker and cheaper, with little or no independent inspection or oversight. Rapids delayed till 2017: see here. 100 stackable modulars for the city centre : see here. The Office of Government Procurement has invited tenders for appointment to a select panel (‘framework’) of up to 20 tenderers (‘framework members’). One successful tenderer will be selected for an initial contract for design and construction of 20 units at Wellview, Mulhuddart in Dublin 15 (the initial contract). Following this more tenders will follow for a planned 1,700 ‘rapid’ delivery houses with a value ex vat of €243k per unit over coming years. Deadline for responses is on 30th September 2016. Tenders are for ‘design and build’ and includes ‘self-certification’ BC(A)R SI.9 sign-off by developers of their own work (for more details see here). This entry was posted in Building Regulations on September 26, 2016 by BRegs Admin. The buzz word of the moment is “rapid” as in rapid build housing. As if the act of calling the housing “rapid build” will somehow get them constructed rapidly! It seems too much egg would be on too many faces to admit that Modular Housing didn’t work as a solution – so instead “modular housing” has morphed into “rapid build housing”. What is an indisputable fact is that rapid build housing is simply timber frame construction. It’s actually debatable whether timber frame construction is quicker or more cost effective than traditional construction. One thing is certain, there is a much greater probability that workmanship defects, omissions or errors in rapid timber frame build will lead to life threatening fire risks. Until oversight of construction is statutory with the need for Building Control Approval prior to commencing on site, and with inspection by the Local Authorities self-certified rapid build is high risk indeed! On another point, the cost of the Tallaght Cross apartments bought by IRES demonstrates how NAMA is simply smoke and mirrors. The build cost of the apartments was surely around the standard of the time, probably somewhere around 1,700 – 2,000eu per sqm at least. NAMA then pumped in many millions more to fix construction problems identified in the external cladding to the apartments raising the construction costs still further. If they were sold at 100,000eu per apartment this represents an enormous discount on their actual construction cost. The difference has come out of our own pockets – just as the original discount NAMA paid to the banks was replaced by us pumping out money in to recapitalise the banks and make up the deficit. IRES are the beneficiaries. NAMA’s just another political smoke screen.